Learn how to flow and dance to different genre of music, through contemporary african dance. 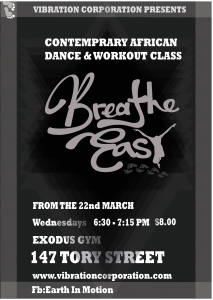 Every Wednesday from the 22nd of March, at the Exodus Health and Fitness Club. 147 Tory Street, 6:30 – 7:15 PM, $8:00. Come, experience and enjoy the root of modern dance! 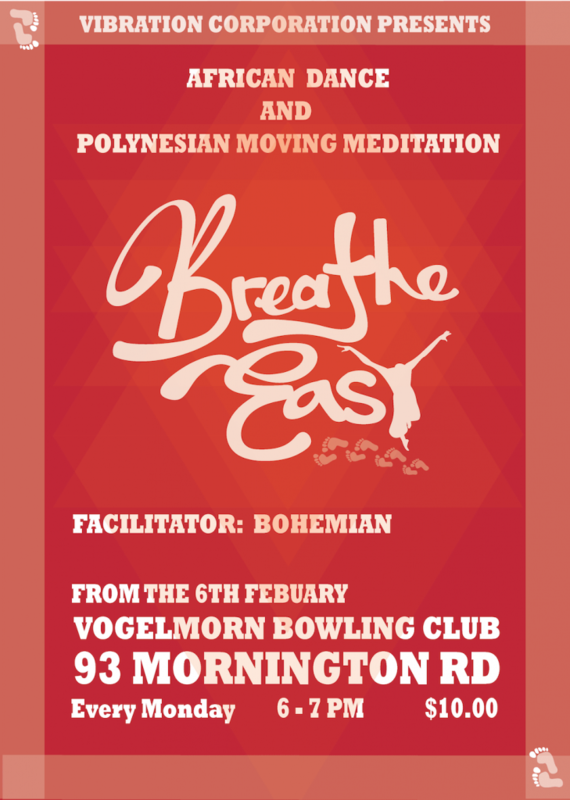 After a lot of intuitive learning and personal development over the years, I am pleased to announce the Breathe Easy dance class commencing on the 6th of feb (Waitangi day), at the Vogelmorn Bowling Club. Mornington road. Breathe Easy, is born out of necessity. A couple of years ago, I posted a face book comment of an incident that happened to me at the Freyberg pool in wellington; where I was labelled a terrorist for spotting a beard, and carrying a backpack in the mens changing room. It was this incident that inspired Breathe Easy movement, and the desire to share some of the wellbeing knowledge acquired over the years of practice into a dance fusion class. Learn about the flow of energy; improve your awareness and gain inner strength by connecting to your inner child through Polynesian moving mediation and contemporary African dance. Come and enjoy movement and stillness with breath work and continue 2017 in a vibrational high.